Pop culture perpetuates the idea that foxes scheme and steal incessantly; but that simply isn't the case. Although foxes enjoy pilfering a chicken coop for fresh eggs from time to time, it isn't their only objective in life. Foxes actually have a lot in common with a house cat. They tend to be loners who spend most of the day laying around listlessly and napping on and off. In fact, foxes have the potential to be so docile that some people choose to keep them as pets. If you have a son or daughter at home who is currently captivated with animal facts then you may want to share this insight with them. 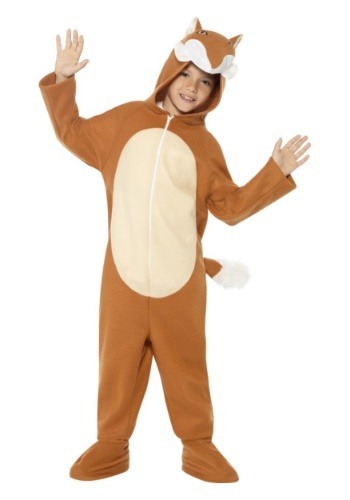 Next, gift them with this fox costume for kids. Once they are fully clad in the soft zip-up jumpsuit with attached character hood, they can choose what type of fox they want to portray. Will they decide to bea sly egg-stealing animal that's depicted on silver screen or will they cuddle up on your lap like an obedient domesticated pet fox? We shall soon see!